How to Keep LED Display Dry in Rainy Season? In the rainy season, the LED display is improperly stored and causing problems such as dead lights, dark lights, short circuits, open circuits and damage to the lamp body. Don't be afraid, we will teach you the methods to moisture-proof for LED display in rainy season. The LED module needs to be dry and ventilated. When it is stored, it should be padded with pallets or other objects. It should not be in direct contact with the ground.The storage environment is equipped with a temperature and humidity monitor. The ambient humidity is controlled below 60% RH, and make the LED module comfortable. The LED module is packaged with moisture barrier bag, and the unsealed product needs to be repackaged and placed in a suitable desiccant. If the LED module storage time exceeds 1 month, the module should be taken the aging test with gradually increased in brightness for 6 hours before use: the full brightness is set to 10%/1H, the full brightness is set to 30%/1H, and the full brightness is set to 60%/2H, full brightness is set to 80%/1H, full brightness is set to 100%/1H. After 6 hours of aging, it can be assembled for the entire LED screen. The temperature and humidity monitor is installed for the outdoor LED display to monitor the humidity around the screen in time. After the first rainy day or heavy rain after the installation of the screen body, it is necessary to check whether there is moisture or water droplets in the LED display interior. Under the ambient humidity of 10% to 85% RH, open at least once a day, the display works normally for more than 2 hours each time. If the ambient humidity is higher than 90% RH, the environment of the LED screen should be dehumidified, and LED display should be working normally for more than 4H every day. The third type to moisture-proof : moisture-proof for indoor LED display. In the ambient humidity of 10% to 65% RH, the LED display screen is opened at least once a day, each time ensuring normal operation for more than 4 hours.If the ambient humidity is higher than 65% RH, the environment of the screen should be dehumidified, and the LED display should be working normally for more than 8H every day. At night, the near doors and windows should be closed to prevent damage to the LED screen caused by nighttime resurgence. After each use, it should be immediately loaded into the air transfer case for sealed storage.Each air transfer case shall be provided with a desiccant or hygroscopic bag of not less than 50g; and the desiccant or hygroscopic bag shall be inspected regularly for failure, and shall be replaced every 2 months. In the ambient humidity of 10% ~ 65% RH, the LED display should be taken out every two months to light up (play video) 2H or more. If the ambient humidity exceeds 65% RH, the LED display should be taken out every week to light up (play video) 2H or more. During the use of the LED screen body, the LED screen should be protected from rain or water. If it touches water, the water should be wiped dry and blown dry with a hair dryer. 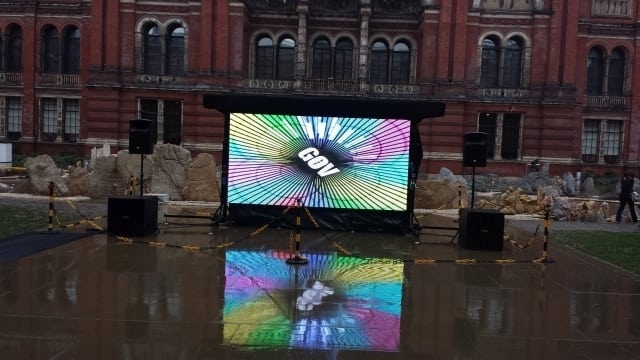 At the same time, the LED screen should be placed 2H and then lighted to work 2H.It is strictly forbidden to use the indoor rental screen as an outdoor rental screen, especially in the open air environment.